Age-related decreases in immune function are thought to contribute to the reduced efficacy of vaccinations seen in elderly populations. Our previous in vitro studies demonstrated that naive CD4 T cells from aged TCR-transgenic mice proliferate less than young cells and generate poorly functioning effectors due to decreased IL-2 production. In this current study, we show that this age-related defect in CD4 T cell response also occurs in vivo and that it is correlated with reduced NF-κB activation. After transfer to young hosts, CD4 T cells from aged transgenic mice proliferate less and produce reduced levels of IL-2 upon immunization with Ag and alum. Introducing a combination of the inflammatory cytokines TNF-α, IL-1, and IL-6, or the use of an adjuvant such as CFA that induces these cytokines, markedly enhanced responses of these aged CD4 T cells, so that they proliferated and produced IL-2 similar to young cells. This enhancement is correlated with the enhanced activation of the transcription factor NF-κB in aged cells. We suggest that induction of inflammatory cytokines via adjuvants may enhance the efficacy of vaccinations in elderly populations. As individuals age, their ability to respond to and clear pathogens declines. This leads to a greater incidence and severity of infectious disease and is the reason that the elderly are a major population targeted for vaccination (1, 2, 3, 4). However, the efficacy of vaccination of the elderly is undermined because of age-related defects in the immune system. This has been observed for a variety of vaccines including Streptococcus pneumoniae, influenza, hepatitis, and tetanus (1, 2, 3, 4) and is thought to be the result of a compromised immune response. Importantly, the cognate helper functions of CD4 T cells are particularly defective in the aged (5). For any vaccine to induce protective immunity, CD4 T cell help is essential (6, 7). Specifically, IL-2 production by CD4 T cells is a principal mediator of both priming and optimal differentiation and it has been shown recently that effective immunization requires IL-2 production by CD4 T cells (6). This central role of CD4-derived IL-2 in vaccine-induced protection is illustrated by it being required for optimal CD40 ligand (CD40L)3 expression (8, 9) and thus, optimal cognate interaction between the CD4 T cell and both B cells and CD8 T cells (10, 11). Thus, in the absence of robust CD4 T cell help and CD40L expression, both CTL activity and humoral responses are reduced. Our own and other published studies show that CD4 T cells from aged individuals produce less IL-2, proliferate poorly, and differentiate less well upon Ag stimulation (12, 13). In light of these observations, we have hypothesized that it is principally poor IL-2 production by CD4 T cells in aged individuals that leads to their poor response to vaccination. If poor induction of IL-2 production by current vaccines is the cause of poor responses, then it would appear that more potent induction of cellular responses in aged individuals may improve vaccine efficacy. With this in mind, the presence of the inflammatory cytokines TNF-α, IL-1, and IL-6 (T/1/6) could likely improve vaccine regimes, because they improve both the expansion and survival of CD4 T cell effectors (14, 15, 16). The adjuvant activity of these cytokines is likely a result of their ability to enhance proliferation and IL-2 production by TCR-stimulated CD4 T cells as well as their ability to enhance the expression of the CD40L and OX40 molecules (17), which are essential for optimal cognate interaction. In our previous study, we demonstrated that poor effector function of aged CD4 T cells could be overcome by the addition of IL-2 in vitro (12). To extend this observation, and to begin to address our hypothesis, we have examined the response of aged CD4 T cells in vivo using an adoptive transfer model. Using this model, we can for the first time, compare the ability of young and aged Ag-specific CD4 T cells to respond to Ag in vivo. In support of our in vitro data, we show here that aged T cells proliferate less well and produce less IL-2 upon vaccination with alum as an adjuvant. Importantly, we can overcome this deficit by using a more potent adjuvant or by simply adding the cytokines T/1/6 to the vaccination protocol. Furthermore, these cytokines, when added to in vitro Ag/APC-stimulated cultures of aged CD4 T cells, not only increase proliferation and IL-2 production, but also induce increased NF-κB translocation in the aged T cells. These data indicate that increased priming of aged CD4 T cells can be achieved in vivo with the use of defined molecules. This observation supports the contention that vaccines specifically formulated to include or induce these cytokines are likely to be of great utility in protecting the aged population. AND H-2k/k TCR-transgenic (Tg) mice express a Vβ3/Vα11 TCR transgene that recognizes the 88–104 fragment of pigeon cytochrome C (PCCF) in the context of IEk (18). Syngeneic CD4 knockout (KO) k/k mice (6- to 12-wk-old) were used as adoptive hosts. B10.BR mice used for RNase protection assays (RPA) were 2–4 mo of age. All mice were bred and housed at the animal facilities at the Trudeau Institute until their use at 2- to 4-mo (young) and 14- to 16-mo-old (aged). All experimental procedures involving mice were approved by the Trudeau Institute Institutional Animal Care and Use Committee. Lymphocytes were harvested from spleens and peripheral lymph nodes (LN) (inguinal, axial, cervical) from young (6 wk to 3 mo) and aged (14–17 mo) AND TCR Tg mice. The isolation and culturing of spleen cells enriched for CD4 cells has been described previously (12). The resulting populations are 85–90% CD4 positive. DCEK-ICAM, a fibroblast cell line that expresses B7.1, ICAM-1, and class II MHC (I-Ek) molecules, was used as APC at a 2:1 T to APC ratio. Recombinant murine IL-2, obtained from culture supernatant of X63.Ag8-653 cells transfected with cDNA for murine IL-2 (19), TNF-α, IL-6, and IL-1 (Peprotech, Rocky Hill, NJ) were all used at a final concentration of 10 ng/ml, which was found to be optimum for these studies (data not shown). CD4 effectors were generated by culturing naive TCR Tg CD4 cells (2 × 105/ml) with 5 μM PCCF and mitomycin c-treated DCEK-ICAM cells with or without exogenous cytokines. After 4 days of culture, effectors were washed and restimulated with Ag/APC at 2 × 105 cells/ml; 24-h supernatants were collected and assayed for cytokine secretion. Culture supernatants collected after 24 h of culture were assayed for the presence of IL-2 in a bioassay with NK-3 cells. TNF-α, IL-1, and IL-6 have no effect on the response of NK-3 cells (data not shown). Naive Tg CD4 populations from young and aged mice were labeled with the dye CFSE (Molecular Probes, Eugene, OR) as previously described (12). Cells were then washed twice, recounted, and used as described. Naive TCR Tg CD4 cells (3 × 106) from young and aged mice were CFSE labeled and adoptively transferred to syngeneic CD4 KO hosts by i.v. injection. On the same day, these hosts were immunized i.p. with 90 μg of PCC peptide in either alum, CFA, or with the cytokines TNF-α (250 ng), IL-1β (500 ng), and IL-6 (500 ng) (all from Peprotech). When cytokines were used as the adjuvant, they were also administered i.p. (without Ag) on days 1 and 2 after immunization with peptide. This immunization protocol with cytokines was adapted from Pape et al. (14). Spleens and peripheral LNs were recovered from the individual adoptive hosts at indicated time points. Lymphocyte populations were counted, stained for CD4 and TCR Tg (Vβ3), and analyzed for phenotype or intracellular cytokine staining as described below. The fold expansion from days 1 to 3 was calculated by dividing the number of donor cells recovered on day 3 by the number recovered on day 1. All staining was done at 4°C in PBS with 1% BSA and 0.1% NaN3. The following Abs and fluorescent reagents were used: anti-CD4 CyChrome (clone RM4-5; BD PharMingen, La Jolla, CA), anti-Vβ3 biotin (clone KJ25; BD PharMingen), streptavidin-allophycocyanin (Southern Biotechnology, Birmingham, AL). Isotype control Abs were purchased from BD PharMingen. Flow cytometry was conducted using a FACSCalibur flow cytometer (BD Biosciences, Mountain View, CA) and the data were analyzed with Cell Quest software. Splenocytes and LN cells from adoptive hosts (1 × 107/ml) were restimulated for 4 h with PMA (2 ng/ml) and ionomycin (200 ng/ml). Brefeldin A (10 μg/ml final concentration; Sigma-Aldrich, St. Louis, MO) was added 2 h after culture initiation. Cells were surface stained for CD4 and TCR Tg (Vβ3) expression as described above. Intracellular cytokine staining was performed using either anti-IL-2 PE (clone S4B6; BD PharMingen), or isotype control-PE (BD PharMingen) as described (12). All samples were then analyzed on a FACSCalibur cytometer and the data were analyzed with CellQuest software. Young B10.Br mice were immunized i.p. with alum or CFA prepared with PBS (no Ag) or PBS alone. Peritoneal exudate cells (PEC) were harvested at 24 h and total RNA was isolated from cells using TRIzol (Life Technologies, Grand Island, NY). mRNA levels were determined using the RiboQuant Multipurpose RNase Protection Assay system (BD PharMingen) and the mCK-3 (TNF-β, lymphotoxin (LT)β, TNF-α, IL-6, IFN-γ, IFN-β TGF-β, migration inhibitory factor) and mCK-2b (IL-12, IL-10, IL-1α, IL-1β, IL-18, IL-6, IFN-γ, migration inhibitory factor) probe sets. The signal from bands were detected using the densitometric feature of Quantity One software (Bio-Rad, Hercules, CA) and normalized against the housekeeping gene L32. In vitro effector populations (Ag/APC alone or with T/1/6) were generated from young and aged Tg mice as described above. After 4 days of culture, effectors were washed and restimulated with anti-Vβ3 (10 μg/ml) and anti-CD28 (clone 37N51.1, 5 μg/ml) at 3 × 106/ml for 4 h. Nuclear extracts were prepared as previously described (20, 21). Binding reactions were performed using 2 μg of nuclear proteins and [32P]dCTP end-labeled double stranded oligonucleotide probes containing binding sites for NFAT, AP-1, and NF-κB (22, 23, 24, 25). Differences between young and aged populations were analyzed by paired Student’s t test. Values of p < 0.05 were considered significant. Because AND TCR Tg CD4 cells retain a naive phenotype (CD44lowCD62LhighCD25neg), even in very old animals (26), our model allows us to compare homogenous populations of Ag-specific naive CD4 T cells which differ only in that they are derived from young or aged mice. Our previous results (26) also show that these Tg CD4 T cells from aged mice function like naive T cells. They do not respond to anti-CD3 stimulation alone and require costimulatory signals such as anti-CD28. These aged T cells also only produce IL-2, and not effector cytokines such as IL-4 or IFN-γ, upon stimulation with Ag/APC. Both of these traits are characteristic of truly naive CD4 T cells (27, 28, 29). Consequently, the homogeneity of these T cell populations allows us to assess the intrinsic defects of the T cell population in the absence of the complication of the aged microenvironment. In addition, we have examined whether these naive Tg CD4 T cells in the aged mice are actually chronologically older than those in younger mice. To address this point, we thymectomized Tg mice at 4 wk of age, thus eliminating new T cell production. We compared the ex vivo responses of Tg CD4 T cells from thymectomized and sham control mice at different time points after thymectomy. We found that at 8 mo post-thymectomy, defects in response to Ag begin to appear. This includes reduced expansion, reduced CD25 expression, and reduced IL-2 production (L. Haynes, S. M. Eaton, E. M. Burns, T. D. Randall, and S. L. Swain, manuscript in preparation). These results show that thymectomy accelerates the appearance of the “aged” phenotype, because these characteristics are very similar to what we observe from intact aged animals (12, 26). These results indicate that the chronological age of CD4 T cells has a negative impact on their function and the impairment in responses that we observe in cells from aged mice is likely due to the fact that they are chronologically older than those in young mice. By transferring naive TCR Tg T cells from either young or aged donors, we were able to follow proliferation of these T cells in response to Ag. When CFSE-labeled naive CD4 T cells from young donors were transferred into young hosts and then immunized with peptide Ag and alum, they proliferated well (Fig. 1⇓A). In contrast, CFSE-labeled naive cells from aged donors were slower to proliferate and proliferated to a lesser degree over the first 3 days of exposure to Ag. This reduced proliferation leads to a significantly reduced yield of aged cells as compared with young by day 3 postimmunization (Fig. 1⇓B). Reduced in vivo expansion of aged CD4 T cells. Naive Tg CD4 T cells from young and aged mice were CFSE labeled and transferred to young syngeneic CD4 KO hosts immunized i.p. with PCC peptide/alum. On days 1–3, spleens and LNs were harvested and CFSE staining was assessed. A, Representative FACS histograms showing CFSE profiles of young (open) and aged (shaded) Tg CD4 cells. As indicated in the FACS dot plots, histograms are gated on Vβ3+CD4+ cells. B, Fold expansion of donor young and aged Vβ3 CD4 cells from days 1 to 3 after immunization with peptide/alum. Bar graph shows means ± SE of four experiments; ∗, p < 0.05. To determine whether IL-2 production by aged naive CD4 T cells was reduced in vivo, as we have shown in vitro (12), we examined IL-2 production from these in vivo-generated effector populations described in Fig. 1⇑. TCR Tg T cells from young or aged donors were reisolated from the primed hosts and cultured ex vivo with PMA/ionomycin and brefeldin A. This method of ex vivo stimulation has been used by other researchers to determine the amount of cytokine produced by in vivo-generated effector populations (30, 31, 32), and because it is a short time period (4 h), only previously activated populations will exhibit positive staining. After this brief ex vivo stimulation, IL-2 production was determined by intracellular cytokine staining. By gating on the Vβ3+CD4+ lymphocytes, we determined both the percent staining positive for IL-2 and the geometric mean fluorescent intensity (G-MFI) at each time point (days 1, 3, and 6). Fig. 2⇓A shows representative flow cytometry histograms demonstrating that there were at least 2-fold fewer IL-2-producing cells in the hosts which received aged donor CD4 T cells. Similar to the percent IL-2 positive, the G-MFIs indicate that the population of young donor cells is approximately twice as bright as those from aged donors. These results demonstrate that while all of the donor cells produce IL-2, the young donor cells produce more on a per cell basis, compared with aged donor cells. Fig. 2⇓B shows the compiled data indicating the percent IL-2 staining and G-MFI on day 3 for all experiments performed. Reduced ex vivo IL-2 production by aged CD4 T cells. Young and aged Tg CD4 cells from immunized adoptive hosts described in Fig. 1⇑ were harvested on days 1, 3, and 6 after immunization. Cells (spleen and LN) were stimulated ex vivo with PMA/ionomycin for 4 h and intracellular staining for IL-2 was performed. A, FACS histograms are gated on Vβ3+CD4+ cells as shown in Fig. 1⇑. G-MFI and percent IL-2 positive staining are indicated for each histogram; dotted lines represent isotype controls. No IL-2-positive cells were observed in control cultures not given PMA/ionomycin. Representative of seven experiments. B, Graph showing the percent IL-2-positive staining and G-MFI of young (solid) and aged (striped) donor populations on day 3 (means ± SE) for seven experiments; ∗, p < 0.05. Inflammatory cytokines such as TNF-α, IL-1, and IL-6 have been shown to enhance the in vivo expansion and survival of CD4 T cells (14, 15, 16). Thus, we determined whether adjuvants that induce these cytokines or these cytokines themselves could enhance the in vivo function of Tg CD4 T cells from aged mice. As in the experiments described in Figs. 1⇑ and 2⇑, CFSE-labeled naive Tg CD4 T cells from young or aged mice were transferred to young hosts. Fig. 3⇓A shows CFSE profiles of donor CD4 T cells on day 6 after immunization with PCC peptide in alum, in CFA, or with T/1/6. Immunization with peptide in alum induced poor expansion of donor cells from aged mice, while immunization with peptide plus T/1/6 or in CFA led to extensive expansion of aged CD4 cells, similar to responses seen with the young cells. This effect of T/1/6 and CFA on the response of aged cells was also apparent in the total numbers of Tg cells recovered as shown in Fig. 3⇓B. Similar numbers of young and aged donor cells were recovered on day 6 after immunization with T/1/6 or CFA, while there was significant decrease in donor cell recovery with alum. 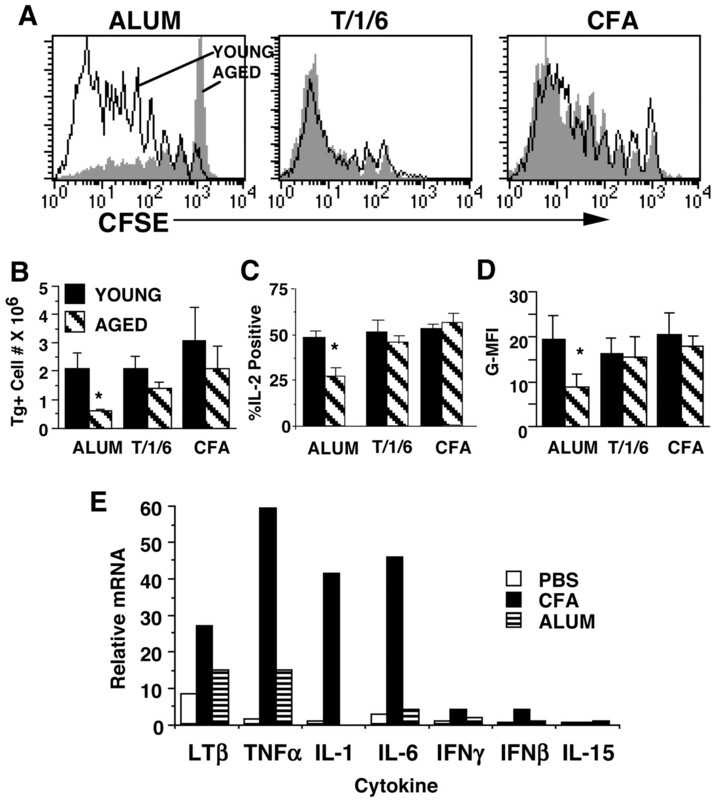 Furthermore, upon immunization with peptide plus T/1/6 or CFA, donor CD4 from cells of young and aged mice produced similar high levels of IL-2, as determined by intracellular staining, while there was a significant age-related difference in IL-2 production when the hosts were immunized with peptide with alum. Fig. 3⇓C shows the percent donor cells staining positive for IL-2 and Fig. 3⇓D shows the G-MFI for these populations. T/1/6 and CFA induce increased in vivo expansion and IL-2 production by aged cells. Naive Tg CD4 T cells from young and aged mice were CFSE labeled and transferred to young syngeneic CD4 KO hosts immunized i.p. with peptide in alum, CFA, or plus a combination of TNF-α (250 ng), IL-1 (500 ng), or IL-6 (500 ng). On day 6, spleens and LNs were harvested and CFSE staining was assessed. 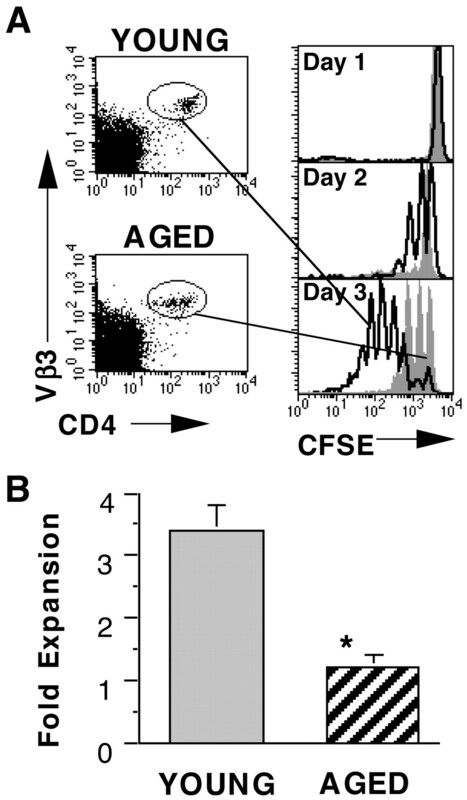 A, Histograms of young (open) and aged (shaded) cells showing CFSE profiles are gated on Vβ3+CD4+ cells as described in Fig. 1⇑. 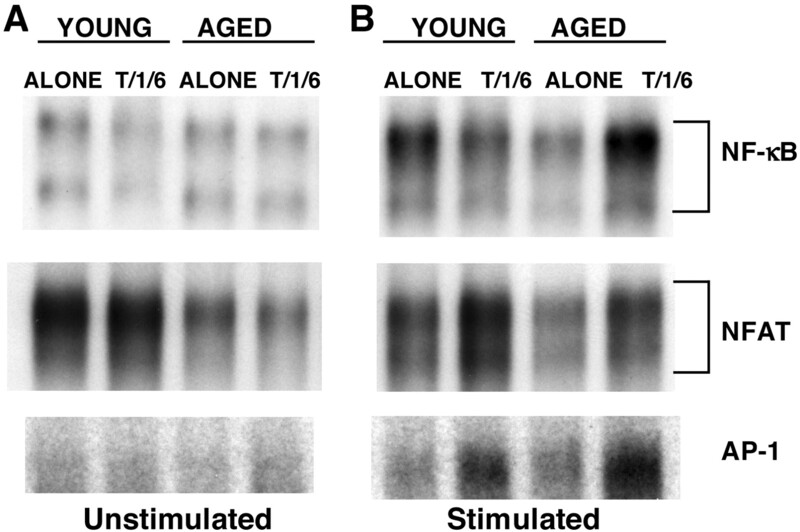 B, Bar graph showing the total recovery of young (solid) and aged (striped) donor Tg cells on day 6 after immunization; representative of at least three experiments. C, Graph summarizing IL-2 intracellular staining for young (solid) and aged (striped) donor Tg cells comparing alum, T/1/6, and CFA; graph shows mean ± SE of at least three experiments; ∗, p < 0.05. D, Graph summarizing G-MFI of IL-2 staining for young (solid) and aged (striped) donor Tg cells comparing alum, T/1/6, and CFA; graph shows mean ± SE of at least three experiments; ∗, p < 0.05. E, Young nontransgenic B10.Br mice were immunized i.p. with adjuvants alone: alum (striped), CFA (solid) or PBS control (open). At 24 h, PECs were harvested and total RNA was prepared. RNA was assayed by RPA. OD readings of bands for each cytokine were normalized to L32 mRNA to obtain relative mRNA quantities. Other cytokines that were not induced by CFA or alum include IL-12 p35 and p40, IL-10, IL-4, IL-5, IL-13, IL-9, IL-2, and TGFβ. Representative of two experiments. To confirm that immunization with CFA induced higher levels of host inflammatory cytokines (33) compared with alum, host cytokine production after immunization was examined. Hosts were immunized with adjuvant/PBS with no transfer of donor CD4 T cells and cytokine mRNA production was examined by RPA (Fig. 3⇑E). Immunization with CFA induced higher levels of transcripts for LTβ, TNF-α, IL-1, and IL-6 compared with immunization with alum, thus confirming other published studies (33). Our results indicate that the combination of T/1/6 cytokines used as an adjuvant, or the use of adjuvants such as CFA which induce these cytokines, could significantly improve in vivo expansion, survival, and IL-2 production by aged CD4 T cells so that their response was equivalent to those of young cells. Because the cytokines T/1/6 exhibited a significant enhancement of aged CD4 T cell function in vivo, we next determined whether these cytokines could enhance the in vitro function of aged cells. Tg CD4 T cells from young and aged mice were cultured with Ag/APC with or without exogenous T/1/6 and initial IL-2 production was determined. Fig. 4⇓A shows that in the absence of exogenous cytokines, naive Tg CD4 T cells from aged mice produced about half the level of IL-2 compared with cells from young mice, confirming our previous observations (12). Importantly, when T/1/6 were added at the initiation of the cultures, IL-2 production by aged CD4 T cells was significantly increased. CD4 cells from young mice also produced slightly increased IL-2 levels in the presence of T/1/6, but this increase was not statistically significant. T/1/6 enhance in vitro responses of CD4 T cells from aged mice. Tg CD4 T cells from young and aged mice were stimulated with Ag/APC alone (□) or with T/1/6 (10 ng/ml each; ▪). A, IL-2 production by young and aged cells (2 × 105 cells) 24 h after initial stimulation. B, The fold expansion of young and aged Tg cells after 4 days of culture with Ag/APC and cytokines was determined by dividing the total cell recovery on day 4 by the input cell number. C, IL-2 production by 2 × 105 4 day effector populations after restimulation with Ag/APC. For all graphs, each symbol represents the results of a single experiment; ∗, p < 0.05; ns, no significant difference. Fig. 4⇑B shows that after 4 days, the effectors from young mice generated with Ag/APC alone expanded significantly more than the effectors from aged mice. When effectors were generated with exogenous T/1/6, both young and aged populations expanded similarly with the cells from aged mice exhibiting an ∼2-fold increase in expansion compared with cultures generated with Ag/APC alone. This increased expansion of effectors from aged mice in the presence of T/1/6 was statistically significant compared with expansion with Ag/APC alone. Because the major cytokine produced by effectors generated under nonpolarizing conditions is IL-2 (34), we monitored the IL-2 production of each of these in vitro-generated effector populations upon restimulation with Ag/APC. To determine effector IL-2 production, each population was harvested, washed, and equal numbers were restimulated with Ag/APC. Fig. 4⇑C shows that effectors generated from aged mice with Ag/APC alone produced greatly reduced levels of IL-2 compared with effectors generated from young mice, as we have shown previously (12). Strikingly, effectors from aged mice which were generated with exogenous T/1/6 secreted significantly higher levels of IL-2, similar to effectors from young mice. These results indicated that CD4 cells from aged mice exhibit a defect that leads to reduced proliferation and IL-2 production and that the addition of the inflammatory cytokines T/1/6 restored both the in vitro expansion and IL-2 production. To explore how inflammatory cytokines might improve aged CD4 T cell responses, we examined whether induction of transcription factors was deficient in aged CD4 T cells. Because several transcription factors such as AP-1, NFAT, and NF-κB are involved in the regulation of IL-2 gene expression (35), we examined the presence of these factors in the nucleus of the young and aged effector populations described in Fig. 4⇑. All of these young and aged effector populations are from 83 to 89% Tg+, with no age-related differences (data not shown). Nuclear extracts were generated from in vitro-generated effectors before or after restimulation with anti-Vβ3/anti-CD28 and examined by EMSA. No difference in the basal levels of NF-κB DNA binding was observed between young and aged effectors before stimulation (Fig. 5⇓A). However, the levels of NF-κB DNA binding in aged CD4 effectors generated without exogenous cytokines after activation were severely reduced compared with the levels in young activated effectors (Fig. 5⇓B, top panel). Interestingly, NF-κB DNA binding was restored in aged effectors differentiated in the presence of T/1/6. In correlation with our previous studies (36), we observed an accumulation of NFAT complexes in the nucleus of young effectors that contained primarily NFATc2 (Fig. 5⇓B, middle panel; upper complex). In contrast, low levels of NFAT DNA binding could be found in aged effectors. After stimulation, a lower NFAT complex was induced in young effectors, while reduced levels of NFAT complexes were present in activated aged effectors. Unlike NF-κB, the presence of T/1/6 during differentiation did not completely restore NFAT binding. We also examined AP-1 DNA binding (Fig. 5⇓B, lower panel), but no substantial difference was observed between young and aged effectors. The specificities of the probes used in our studies was confirmed in cold competition control experiments (data not shown). Together, these results indicate that a part of the transcriptional machinery that regulates IL-2 gene expression in CD4 T cells from aged mice is impaired. The defective NF-κB DNA binding could be responsible for the inability of the aged cells to produce IL-2 because it also reached normal levels when effectors were cultured in the presence of T/1/6. Impaired transcriptional machinery in CD4 T cells from aged mice. Tg CD4 T cells from young and aged mice were stimulated with Ag/APC alone or with T/1/6 (10 ng/ml each). Nuclear extracts from equal numbers of 4-day effectors were prepared: A, before restimulation; B, after restimulation with anti-Vβ3/anti-CD28 for 4 h. EMSAs were performed using [32P]dCTP-labeled probes for NF-κB (top), NFAT (middle), and AP-1 (bottom) transcription factors. Representative of three experiments. In the elderly, vaccinations are not as efficacious as in the young (1, 2, 3, 4). This is a major public health problem, because the elderly are more susceptible to infectious disease and are, therefore, targeted for vaccinations. Because robust primary T cell responses are responsible for successful vaccination, we theorize that vaccine efficacy can be improved by enhancing T cell priming (6, 7). Furthermore, by improving the primary CD4 T cell responses, we will also enhance immune effector functions, such as cognate help for Ab or CTL generation (10, 37). This will, in turn, lead to improved protective immunity. In this current study, we have identified adjuvants which can enhance the primary response of CD4 T cells in the aged. Our results suggest that inflammatory cytokines can overcome the reduced transcription factor activation in aged CD4 T cells, thus enhancing IL-2 production, which in turn, leads to enhanced CD4 effector generation. The results of our studies are quite significant. We show, for the first time, that in vivo CD4 T cells from aged donors proliferate less and produce less IL-2, even when primed in a young host. This correlates well with our previous in vitro studies showing reduced Ag-specific responses of CD4 T cells from aged mice (12, 26). Our in vivo results indicate that there are intrinsic defects in the ability of CD4 T cells from aged mice to respond to immunization with peptide Ag in alum. This is especially important because alum is the only adjuvant approved for use in human vaccines (38). We found that a combination of inflammatory cytokines can enhance the Ag-specific responses of TCR Tg CD4 T cells from aged mice. In vitro, the defect in proliferation and IL-2 production by CD4 T cells from aged mice could be corrected by addition of T/1/6 to the cultures. The production of adequate levels of IL-2 by CD4 T cell effectors from aged mice is very important, because this cytokine is essential for optimum vaccine efficacy (6, 39). By examining the induction of transcription factors in vitro, we found that NF-κB levels are greatly reduced when CD4 cells from aged animals were stimulated with Ag/APC alone and that this could be enhanced by the addition of the inflammatory cytokines T/1/6. Because NF-κB is responsible for expression of a wide array of genes involved in initial T cell responses, including IL-2 (40), increased expression of NF-κB may explain the ability of T/1/6 to increase IL-2 production by aged CD4 T cells. These results also imply that activation of CD4 T cells is not only dependent upon TCR signaling, but is also positively modulated by additional signaling via cytokine receptors. Furthermore, the ability of T/1/6 to increase the response of aged CD4 T cells suggests that the defect in these aged cells may be restricted to TCR signaling and may not extend to cytokine receptor-mediated events. In vivo, T/1/6 used as an adjuvant enhanced the proliferation and IL-2 production by donor CD4 cells from aged mice. This is relevant for vaccine design because robust effector generation and IL-2 production are correlated with increased vaccine efficacy (6, 7). Our results are in accordance with other studies showing that these inflammatory cytokines can act directly on CD4 T cells in vivo, inducing both increased expansion and survival (14, 15, 16). These cytokines have been shown to provide a “third” signal that enhances the costimulation of naive CD4 T cells in vivo, most likely by enhancing NF-κB translocation (15). Furthermore, because these cytokines are induced by products of pathogens binding Toll receptors (TLRs) on APCs (14), vaccines that do not contain inactivated pathogens or pathogen products are likely to be less efficacious. In fact, our results also show that introducing an adjuvant such as CFA, which contains killed mycobacteria, induces markedly enhanced host production of LTβ, TNF-α, IL-1, and IL-6, independent of Ag. Importantly, our studies also show that immunization with peptide in CFA induces good proliferation and IL-2 production by donor CD4 T cells from aged animals. This suggests that in vivo, adjuvants acting through TLR pathways induce inflammatory cytokines and may overcome deficient CD4 T cell responses in the aged. The improved aged CD4 T cell effector function that we observe in our studies should lead to improved immune responses in the elderly because CD4 helper function is critical for B cell differentiation and Ab production, as well as CTL generation. Both of these responses are highly dependent upon appropriate CD4 T cell cognate helper activity (10, 37). By enhancing the primary response of CD4 T cells in elderly individuals, we should be able to improve the efficacy of vaccinations, leading to reduced incidence of illness in this population. We are grateful to Dr. Andrea Cooper for her critical review of this manuscript. ↵1 This work was supported by National Institutes of Health/NIA Grants PO1AG01743 (to S.L.S.) and AG21054 and AG02160 (to L.H.). ↵3 Abbreviations used in this paper: CD40L, CD40 ligand; Tg, transgenic; PCC, pigeon cytochrome C; PCCF, the 88–104 fragment of PCC; KO, knockout; RPA, RNase protection assay; PEC, peritoneal exudate cell; G-MFI, geometric mean fluorescent intensity; TLR, Toll receptor; LN, lymph node; LT, lymphotoxin; T/1/6, TNF-α, IL-1, and IL-6. Phair, J., A. Kauffman, A. Bjornson, L. Adams, C. Linnemann. 1978. Failure to respond to influenza vaccine in the aged: correlation with B-cell number and function. J. Lab. Clin. Med. 92:822. Musher, D. M., A. J. Chapman, A. Goree, S. Jonsson, D. Briles, R. E. Baughn. 1986. Natural and vaccine-related immunity to Streptococcus pneumoniae. J. Infect. Dis. 154:245. Cook, J. M., N. Gualde, L. Hessel, M. Mounier, J. P. Michel, F. Denis, M. H. Ratinaud. 1987. Alterations in the human immune response to the hepatitis B vaccine among the elderly. Cell. Immunol. 109:89. Burns, E. A., L. G. Lum, G. L’Hommedieu, J. S. Goodwin. 1993. Specific humoral immunity in the elderly: in vivo and in vitro response to vaccination. J. Gerontol. 48:B231. Heeney, J. L.. 2002. The critical role of CD4+ T-cell help in immunity to HIV. Vaccine 20:1961. McDyer, J. F., Z. Li, S. John, X. Yu, C. Y. Wu, J. A. Ragheb. 2002. IL-2 receptor blockade inhibits late, but not early, IFN-γ and CD40 ligand expression in human T cells: disruption of both IL-12-dependent and -independent pathways of IFN-γ production. J. Immunol. 169:2736. Skov, S., M. Bonyhadi, N. Odum, J. A. Ledbetter. 2000. IL-2 and IL-15 regulate CD154 expression on activated CD4 T cells. J. Immunol. 164:3500. Haynes, L., P.-J. Linton, S. M. Eaton, S. L. Tonkonogy, S. L. Swain. 1999. IL-2, but not other common γ chain (γc)-binding cytokines, can reverse the defect in generation of CD4 effector T cells from naive T cells of aged mice. J. Exp. Med. 190:1013. Nagelkerken, L., A. Hertogh-Huijbregts, R. Dobber, A. Drager. 1991. Age-related changes in lymphokine production related to a decreased number of CD45RBhi CD4 T cells. Eur. J. Immunol. 21:273. Pape, K. A., A. Khortus, A. Mondino, M. K. Jenkins. 1997. Inflammatory cytokines enhance the in vivo clonal expansion and differentiation of antigen-activated CD4+ T cells. J. Immunol. 159:591. Vella, A. T., T. Mitchell, B. Groth, P. S. Linsley, J. M. Green, C. B. Thompson, J. W. Kappler, P. Marrack. 1997. CD28 engagement and proinflammatory cytokines contribute to T cell expansion and long-term survival in vivo. J. Immunol. 158:4714. Nakae, S., M. Asano, R. Horai, N. Sakaguchi, Y. Iwakura. 2001. IL-1 enhances T cell-dependent antibody production through induction of CD40 ligand and OX40 on T cells. J. Immunol. 167:90. Kaye, J., M.-L. Hsu, M.-E. Sauron, S. C. Jameson, N. R. J. Gascoigne, S. M. Hedrick. 1989. Selective development of CD4+ T cells in transgenic mice expressing a class II MHC-restricted antigen receptor. Nature 341:746. Karasuyama, H., F. Melchers. 1988. Establishment of mouse cell lines which constitutively secrete large quantities of interleukin 2, 3, 4 or 5, using modified cDNA expression vectors. Eur. J. Immunol. 18:97. Tugores, A., M. A. Alonso, F. Sanchez-Madrid, M. O. de Landazuri. 1992. Human T cell activation through the activation-inducer molecule/CD69 enhances the activity of transcription factor AP-1. J. Immunol. 148:2300. Schreiber, E., P. Matthias, M. M. Muller, W. Schaffner. 1989. Rapid detection of octamer binding proteins with “mini-extracts”, prepared from a small number of cells. Nucleic Acids Res. 17:6419. Angel, P., M. Imagawa, R. Chiu, B. Stein, R. J. Imbra, H. J. Rahmsdorf, C. Jonat, P. Herrlich, M. Karin. 1987. Phorbol ester-inducible genes contain a common cis element recognized by a TPA-modulated trans-acting factor. Cell 49:729. Lee, W., P. Mitchell, R. Tjian. 1987. Purified transcription factor AP-1 interacts with TPA-inducible enhancer elements. Cell 49:741. Ghosh, S., D. Baltimore. 1990. Activation in vitro of NF-κB by phosphorylation of its inhibitor IκB. Nature 344:678. Linton, P.-J., L. Haynes, N. R. Klinman, S. L. Swain. 1996. Antigen independent changes in CD4 T cells with aging. J. Exp. Med. 184:1891. Dubey, C., M. Croft, S. L. Swain. 1995. Costimulatory requirements of naive CD4+ T cells: ICAM-1 or B7-1 can costimulate naive CD4 T cell activation but both are required for optimum response. J. Immunol. 155:45. Dubey, C., M. Croft, S. L. Swain. 1996. Naive and effector CD4 T cells differ in their requirements for T cell receptor versus costimulatory signals. J. Immunol. 157:3280. Rogers, P. R., C. Dubey, S. L. Swain. 2000. Qualitative changes accompany memory T cell generation: faster, more effective responses at lower doses of antigen. J. Immunol. 164:2338. Pilstrom, B., L. Bjork, J. Bohme. 1995. Demonstration of a TH1 cytokine profile in the late phase of NOD insulitis. Cytokine 7:806. Roman, E., E. Miller, A. Harmsen, J. Wiley, U. H. Von Andrian, G. Huston, S. L. Swain. 2002. CD4 effector T cell subsets in the response to influenza: heterogeneity, migration, and function. J. Exp. Med. 196:957.
de Pater-Huijsen, F. L., C. M. van der Loos, M. J. de Riemer, J. S. van der Zee, H. M. Jansen, T. A. Out. 2000. Double staining of intracellular cytokine proteins and T-lymphocyte subsets. Evaluation of the method in blood and bronchoalveolar lavage fluid. Histochem. J. 32:3. Barnes, P. F., D. Chatterjee, J. S. Abrams, S. Lu, E. Wang, M. Yamamura, P. J. Brennan, R. L. Modlin. 1992. Cytokine production induced by Mycobacterium tuberculosis lipoarabinomannan: relationship to chemical structure. J. Immunol. 149:541. Iezzi, G., D. Scheidegger, A. Lanzavecchia. 2001. Migration and function of antigen-primed nonpolarized T lymphocytes in vivo. J. Exp. Med. 193:987. Riegel, J. S., B. Corthesy, W. M. Flanagan, G. R. Crabtree. 1992. Regulation of the interleukin-2 gene. Chem. Immunol. 51:266. Rincon, M., R. A. Flavell. 1997. Transcription mediated by NFAT is highly inducible in effector CD4+ T helper 2 (Th2) cells but not in Th1 cells. Mol. Cell. Biol. 17:1522. Baylor, N. W., W. Egan, P. Richman. 2002. Aluminum salts in vaccines–US perspective. Vaccine 20:(Suppl. 3):S18. Heeney, J. L., P. Beverley, A. McMichael, G. Shearer, J. Strominger, B. Wahren, J. Weber, F. Gotch. 1999. Immune correlates of protection from HIV and AIDS–more answers but yet more questions. Immunol. Today 20:247. Baeuerle, P. A., T. Henkel. 1994. Function and activation of NF-κB in the immune system. Annu. Rev. Immunol. 12:141.